I got a Cricut Expression! Woohoo! I'm having SO much fun playing with it! Of course I went totally overboard and got a ton of cartridges and a jukebox and the Design Studio software. The first thing I had to play with were the two Hello Kitty cartridges. LOVE them - too cute!! And then I had to create a template in Design Studio. You weave 2 pieces together to make this cute heart. 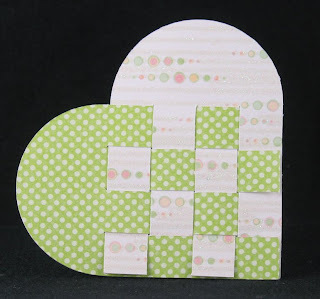 It's done with Plantin SchoolBook and I copied a Hot Off the Press template called Scandinavian Hearts. It was actually easier than I thought and a lot of fun to figure it out! I will definitely be looking around for other things to design! Hope you don't mind a bunch of non-stamping projects, because I'll be posting a lot more Cricut projects in the future! TFL! Wow, it's been a looooong time since I blogged last! The boys have been keeping me really busy and also stole all my mojo away!! I hope you all have a very Merry Christmas today! 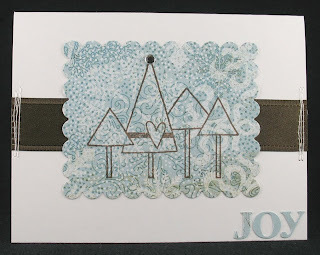 Materials used: Heart Warmers set - Cornish Heritage Farms; patterned paper and alpha stickers - Basic Grey; ribbon - May Arts; rhinestone - the Rhinestone Guy.